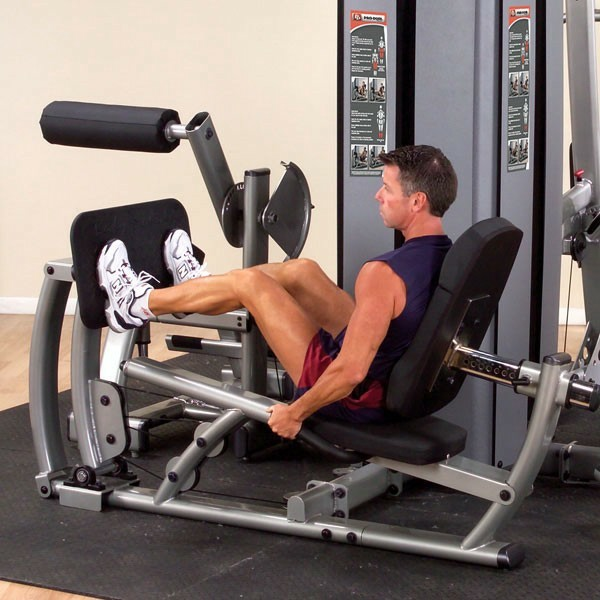 Body-Solid’s Pro•Dual Leg Press/Calf Extension’s advanced design reduces spinal compression while allowing full range of motion in a natural biomechanically efficient movement. The machine features pillow block and sealed ball bearings for preci- sion alignment and friction-free motion. The fully adjustable DuraFirmTM back pad has an ergonomically designed two-position press plate to provide users of every size with a complete leg and calf workout. With gracefully curved frames constructed from sleek, power-coated tubing that exhibits a modern, design-forward aesthetic, the Body-Solid Pro•Dual Leg Press/Calf Extension builds form into function and value into a superior modular strength training system.